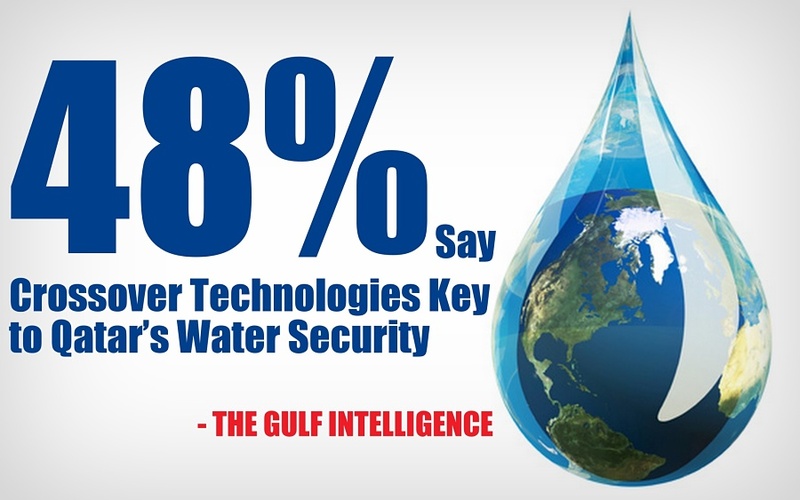 Dubai, May 23, 2016 (Gulf Intelligence) – Qatar’s Industry and Academia must prioritize research and development (R&D) into crossover technologies in order to improve the country’s strained water security as soon as possible, according to 48% of respondents to a Gulf Intelligence (GI) Industry Survey. Improving Qatar’s water security is one of the country’s three Key Challenges outlined in the National Vision 2030, along with energy security and cyber security. Strong communication channels and clear goals between Industry and Academia are vital to ensure that progress is made as quickly as possible. Qatar receives just seven inches of rain a year and relies on desalination to meet 99% of the municipal demand. Crossover technologies mean adopting and adapting innovations from other sectors to suit water operations, which saves considerable time and money. Exploring this alternative could mark a turning point for Industry in Qatar looking to pull back their research and development (R&D) investments in water management. Cost-effective routes to innovation are especially important now as energy producers, including Qatar, feel the economic strain of lower oil and gas prices. In the sphere of crossover technologies, a single technology holds potential for many applications. Automated image analysis can be used by security forces for facial recognition, by doctors for digital pathology, or for investigating water pipes to reduce expensive leakages. Crossover technologies from medicine and aviation are firm favourites for Qatar’s water sector, as both sectors are highly focused on safety and efficiency. Over a third (38%) of respondents said Qatar’s Industry and Academia should instead their R&D on improving the costs and efficiency of existing technologies, such as desalination. As an expensive process, desalination is still not an economically viable long-term option. Qatar is also building a mega water reservoir – one the largest in the world – to increase the country’s national water storage capacity to seven days, with more reservoirs to follow. Crossover technologies could be used to reduce the cost of desalination and boost the efficiency of the mega reservoirs, for example. Under one-fifth (17%) of respondents said that Qatar’s Industry and Academia must abandon today’s technologies and focus on entirely new solutions, though others warn that this could be a costly and risky approach. By using the crossover and other innovative technologies, Doha could strengthen the country’s strained water security outlook. Plus, developing water expertise at home and exporting water solutions to other countries facing similar challenges would support Qatar’s goal to become a knowledge-based economy, as per the country’s National Vision 2030. Gulf Intelligence facilitates knowledge exchange between stakeholders. The strategic communications and public affairs consultancy produces boutique industry forums and roundtable discussion series globally with an architecture that ensures all participants engage in a dynamic and competitive exchange of knowledge towards a shared goal. The Dubai-based firm assists Middle East companies and government entities to tap dormant intelligence and create knowledge reservoirs that can be utilized to bolster their profiles, to communicate with stakeholders and to overwhelm competitors.